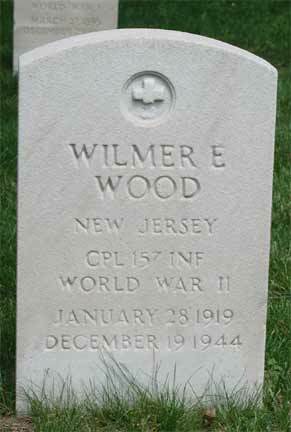 CORPORAL WILMER WOOD was born in New Jersey on January 28, 1919. He was the oldest son of Isaac L. and Anna Wood. In 1930 Isaac Wood was working as a machinists in a locomotive manufacturing plant, and the family was renting a home at 1812 Woodlynne Avenue in Woodlynne NJ. 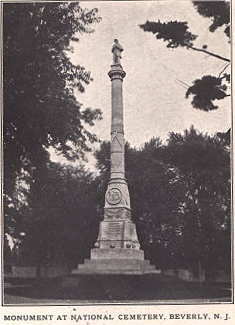 He also had ties to Marlton Pike in Delaware Township. Wilmer Wood had a grammar school education and was single when he went into the service. Wilbur Wood was inducted into the United States Army at Fort Dix NJ on January 27, 1942. He was killed in action in southern France on December 19, 1944. He was survived by his parents, sisters Laura, Mildred, Dorothy, Edith, and Verna; brother Isaac L. Jr., a niece and a nephew. Inducted into federal service as 45th Division at Oklahoma City, OK on 16Feb40 and moved to Fort Sill, OK 23Sep40; arrived at Camp Barkeley, TX 28Feb41 and went to Brownwood, TX 1Jun41 to participate in the VIII Corps Texas Maneuvers there; returned to Camp Barkeley, TX 13Jun41 and moved to Mansfield, LA 4Aug41 where participated in both Aug and Sep41 Louisiana Maneuvers; returned to Camp Barkeley, TX 4Oct41 where redesignated the 45th Infantry Division 23Feb42; arrived at Fort Devens, MA 22Apr42 and Pine Camp, NY 8Nov42; transferred to Camp Pickett, VA 27Jan43 and staged at Camp Patrick Henry, VA 26May43 until departed Hampton Roads Port of Embarkation 3Jun43; arrived in North Africa 22Jun43 and assaulted Scoglitti, Sicily 10Jul 43 and Salerno, Italy 10Sep43; assaulted Anzio 22Jan44 and southern France 15Aug44; entered Germany 17Mar45 and arrived at Boston Port of Embarkation 10Sep45 and moved to Camp Bowie, TX 17Sep45 where inactivated 7 Dec45. The division landed in North Africa on 22Jun43 and trained at Arzew. It assaulted Scoglitti, Sicily on 10Jul43, taking Comiso and Ragusa Airport and repulsing several German counterattacks to contact the Canadian 1st Division 12Jul43. It moved forward through Licodia and Monterosso the next day, crossed the Salso River at Caltanisetta 18Jul43 and clashed with Italian delaying forces in the Vallelunga area 20Jul43. The 157th Infantry cut the north coastal Highway 113 on 22Jul43 and the division fought the Battle of Motta Hill 26-30Jul43, allowing the 179th Infantry to reach S. Mauro. The 180th Infantry, reached Tusa 27Jul43 but failed in its first attempt to force the river. The division was engaged in combat approaching San Stefano by 29Jul43, and was relieved 1Aug43. It then moved to guard western Sicily, detaching the 157th Infantry to make a landing near Barcellona in an attempt to block German-Italian withdrawals. The division assaulted Salerno, Italy 10Sep43 and the 179th Infantry and 157th Infantry engaged in heavy fighting at Ponte Sele and the Tobacco Factory. The 180th Infantry was landed on 14Sep43 and held in reserve. The division seized the heights overlooking Eboli on 19Sep43 and pushed along Highway 91 into the mountains, taking Oliveto 22Sep43, and pushed to the Calore River 27Sep43 despite rains and German demolitions. It took over the 34th Infantry Division's Calore River Bridgehead 3Oct43 and mopped up Titerno Creek, contacting the 34th Infantry Division across the Volturno River 15Oct43. After Piedmonte d'Alife fell 20Oct43, the division was withdrawn to reserve. On 3Nov43 it resumed the offensive by crossing the Volturno below Sesto Campano and battled through the Hitler Line in a ten-day engagement, and next wrested key mountain heights from German defenders beginning 29Nov43. Hill 769 fell to the 179th Infantry 6Dec43 and Mt la Posta to the 180th Infantry 17Dec43. The 180th Infantry attempted to clear the hills north of Casino astride the S. Elia road, but on 9Jan44 the division was withdrawn. The division assaulted Anzio, Italy 22Jan44 and was engaged defending the beachhead for the next four months. On 11Feb44 the 179th Infantry made a vain effort to recover the factory area and the 157th Infantry was isolated west of the Albano Road by counterattacks. On 18Feb44 the division was subjected to a main German counterattack which was contained only after the 179th Infantry was pushed back to the final beachhead lines. On 22Feb44 the British relieved the division and it engaged in holding actions until resuming the offensive during the breakout from Anzio on 23May44. The 179th and 180th Infantry attacked up Albano Road 29May44 and by 4Jun44 the division secured crossings north of Rome. On 16Jun44 the division was withdrawn for rehabilitation. The division assaulted Ste Maxime, southern France on 15Aug44. The 179th Infantry took contested Barjols 18-19Aug44, and the 157th Infantry crossed over the Durance River the next day using a partially destroyed bridge near St Paul. The division crossed the Rh�ne and Ain Rivers northeast of Lyon 30Aug44 and the 179th Infantry saw heavy combat at Meximieux 1-2Sep44. In heavy fighting Villersexel was seized 13Sep44 and it crossed the Moselle in the secured Ch�tel area 21-22Sep44. The 180th Infantry battled for Epinal 22-25Sep44 as the 157th Infantry finally took Girmont 24Sep44, and the division entered the western foothills of the Vosges. After severe fighting Bruyer�s fell 19Oct44 and after several attempts the 180th Infantry managed a bridgehead across the Mortagne near Fremifontaine 22-23Oct44. As the division was pushing slowly toward Raon-l-Etape west of the Meurthe, it was relieved 1-9Nov44 and moved to a rest area. The division moved up to the Saverne Gap on 23Nov44 and captured the forts north of Mutzig in the Maginot Line 25Nov44 and moved up to the Moder when it took Mertzwiller in heavy combat on 5Dec44. Fighting across the Lauter into Bedenthal on 18Dec44, the division engaged in fighting which isolated several elements, but the division contained the Germans along the Philippsbourg-Neuhoffen-Obserteinbach line by 1Jan45. It was in this fightng that Corporal Wood was killed, on December 19, 1944. The division battled in the Bitchie Pocket and captured Wingen 7Jan45, but was forced out of Althorn by counterattacks 11Jan45, and a battalion of the 157th Infantry was decimated northeast of Reipertsweiler 18Jan45. The division was forced back to defensive positions along the Rothbach Rau-Moder River line 29Jan45 and lost Saegmuhl 24Jan45. On 17Feb45 it was relieved in line and withdrawn for rehabilitation. The division was moved north to the Sarreguemines area 15Mar45 and reached the West Wall in the Zweibruecken region 17Mar45. Homburg fell 20Mar45 and the 176th Infantry followed the 6th Armored Division to the Rhine 21Mar45, followed by the rest of the division. After saturation bombing the 179th and 180th Infantry attacked across the river near Hamm 26Mar45. With three regiments abreast the division sped to me Main and established a bridgehead at Obernau on 28Mar45. The division fought the Battle for Aschaffenburg 28Mar-3Apr45 which fell to the 157th Infantry after house-to-house fighting. After attacking the Hohe Rohn Hills the division opened the drive on Nuremberg 11Apr45. The Battle for Nuremberg was fought 16-20Apr45, and then the division moved south to the Danube to prepare a path for the 20th Armored Division toward Munich. The division attacked across the Danube with all three regiments abreast at Merxheim and Bergoldsheim on 26Apr45. It then followed in the wake of the 20th Armored Division to reach Munich 29Apr45, and remained in occupation of the area until hostilities were declared ended on 7May45.